Located in a prime in-town location. 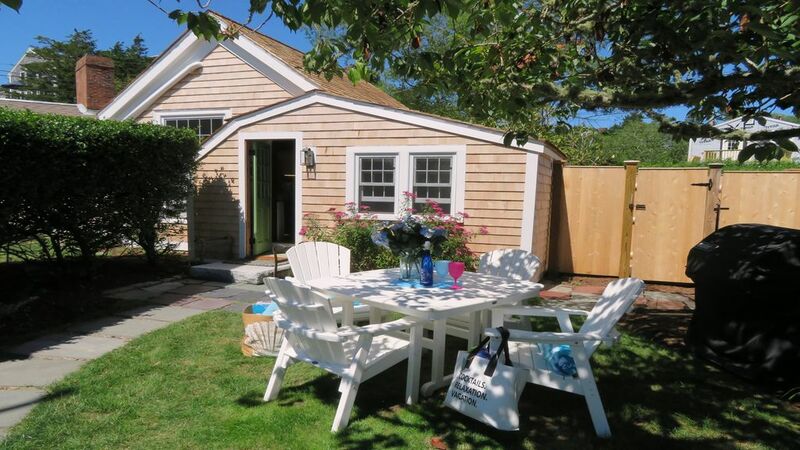 This Cape Cod Vacation Rental Cottage complex is just steps to the Mill Pond (a saltwater inlet of Nantucket Sound) in Chatham's Old Village and a few blocks to beautiful Lighthouse Beach. This desirable and newly renovated family compound built by a famous naval architect, presents itself as one of the few family compounds. It has 3 units. This home is called The Artist Cottage and has 1 bedroom with a Queen bed and a loft with 2 twin beds sleeping a total of 4 and 1 bath. Rent the entire compound or each unit individually. Pet Friendly! (for dogs only). Slimline AC unit in Cottage to keep you cool and free WiFi too. Enter through a little gate and you are facing a group of 3 cottages. This one, The Artist Cottage, is to the far right. It has an open living area with flat Screen TV, a small table with 4 bar stools and a kitchenette (no dishwasher). It has a bathroom with shower and the bedroom on the same level has a Queen bed. Upstairs (steep risers as with all older homes) you will find the loft area offering 2 twin beds. Outside is outdoor dining with table/chairs, gas grill and an enclosed outdoor shower. While this home does not have a washer/dryer---there is a Laundromat nearby at Chatham Laundromat at 768 Main Street Chatham that even has a wash and fold service for your convenience. There is also deeded access connected to this property to your own little beach at lower tides. (grasses at high tides) Meet others families in the area during the summer: swim, kayak, clam or make sand castles! Nothing beats being by this salt water inlet of Nantucket Sound during your vacation! Deep water access is also a plus for someone who may want to moor a power boat or sailboat. Pease Boat Works next door rents moorings. Very affordable. You can launch from the public landing on Eliphamets! There is a beach umbrella, Kids Beach toys and yard games for your enjoyment! If you wish to rent the entire compound - check with us on availability. No Smoking Please! Max parking of cars at property: 1. No parking on Lawn anytime. This home allows 1 dog. A Pet Registration form must be completed upon reservation confirmation. This home has Keyless Entry with a 3pm Check-In/10am Check-Out. Quiet enclave close to town. It was very accessible and a lovely little area. Perfect location. Cottage was small but perfect for us and our chocolate lab. Chatham where there is ample and varied shopping and dining. We enjoyed the Impudent Oyster for our seafood fix. Property was as described. It is small, but just enough for the two of us. The guest book indicated that a few renters had one or two small kids, but I can't imagine it with 4 adults or even 2 older children. The sitting/LR only seats 3 and the TV is small 27". The steps to the loft are VERY steep and narrow, no one with any knee/walking problem. Clean and rustic with great old wall murals. Grounds were great w/outside shower (we never used the inside shower). Grounds are shared with two other rentals but good plantings make it fairly private, however if you had partiers in the other rentals it might be too much, we were lucky and had great neighbors. Also dogs would share this lawn. The house is right against (in fact you park in it) a boatyard for wooden boats so you may hear hammering and sawing. As sailors we were right at home. While small, the owners have made great use of space with hidden shelves, hooks etc. for storage, however the kitchen/food storage areas are small. Table folds to increase space. I wouldn't plan any big meals not done on the grill. We will be back. I spent a beautiful and relaxing week in Chatham with a group of friends. We occupied all three of the cottages located on this beautiful property, the Artist's Cottage, the Captain's House, and the Windmill. My personal favorite was the Artist's Cottage - so cozy and comfortable, and decorated with fabulous original old murals. We used the larger Captain's House for our homebase and group meals and activities, but the smaller cottages were also very well-equipped and functional. The property was perfectly located for us to walk nearly everywhere we wanted to go. These historic buildings have been updated to give their visitors all the modern conveniences, while retaining their vintage charm and character, and they are very well maintained. Even the flower beds and huge holly hedges were special, harboring many birds, including a gorgeous male cardinal. I would happily stay here again and will certainly recommend it to friends.